The Libra New Moon occurs October 12th at 5:06 pm MST/PDT. It happens at 19 degrees Libra 20 minutes. Here’s the chart: LibraNewMoon2015. The Scales, Libra’s glyph, is misleading. The Scales have long symbolized balance. However, it’s important to note that Libra is learning balance. Until mastery of this archetype is achieved, Libra experiences imbalance, often to extremes, particularly in relationship dynamics. The number one contributing factor to unhealthy and unsuccessful relationships is an imbalance of power. Who has it? Who doesn’t? Is it acknowledged and wielded equally? Is it used to support one another in independent individual development or is it used in ways that contribute to and maintain co-dependence? To promote relationship balance and equality, Libra must learn to LISTEN! Since Libra also NEEDS TO BE NEEDED, it often derives its identity, value and worth through others. In turn, this leads to Libra’s habitual giving to others so that it will be valued for providing what they think others need. This cannot help but foster co-dependency. Effective listening allows Libra to give and receive (use power) properly, giving what’s actually needed, not what they think the other needs, which all too often simply reflects their own personal projected needs, thus sustaining co-dependence. Recent Venus and Mercury retrogrades encouraged a major review of relationship dynamics particularly issues of equality/inequality and balance/imbalance of power. We can break free of unhealthy relationship patterns and behaviors now. However, if necessary changes are resisted for too long, some unequal situations, especially in partnerships, could end quite abruptly as this New Moon’s central astrological aspect, an opposition between the Sun in Libra and retrograde Uranus in Aries, highlights. This revolutionary aspect always demands greater individual freedom. 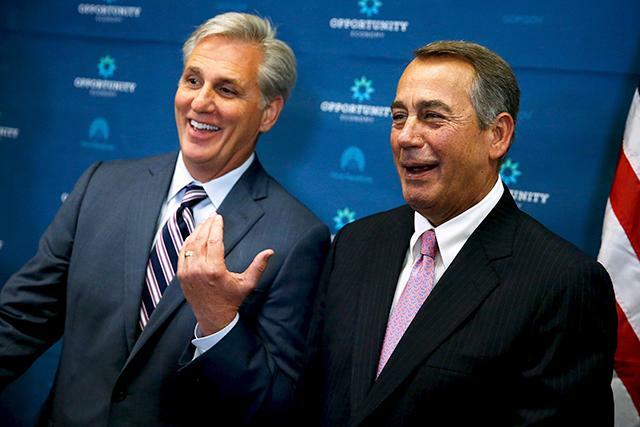 House Speaker John Boehner on right; House Majority Leader Kevin McCarthy on left. We need look no further than the U. S. House of Representatives Republican caucus for evidence of the surprising and rebellious nature of the energy of the Sun opposite Uranus. Current Speaker of the House John Boehner unexpectedly announced his resignation last week shocking even his closest political insiders. His second in command, House Majority Leader Kevin McCarthy, announced he would run to fill the position and was broadly considered a ‘shoe-in.’ However, in a totally surprising turn of events, the so-called “Freedom Caucus,” lamenting their perceived lack of power as rank and file Republicans, refused to support McCarthy throwing the normally routine process of selection of a new Speaker of the House into utter chaos as they rebelled against what they saw as an automatic ‘coronation’ of the next in line. In a second and perhaps even more surprising political ‘bombshell’ McCarthy suddenly announced he was dropping out of the race. ‘Sudden.’ ‘Surprising.’ ‘Unexpected.’ ‘Shocking.’ ‘Chaos.’ ‘Rebellion.’ These are all uniquely Uranian words and phenomena. Because the ‘status quo’ in so many different aspects of our world’s reality ARE NOT BALANCED AND ARE NOT FUNCTIONING IN HEALTHY PRODUCTIVE WAYS, we can expect even more bombshells – politically, economically, socially and culturally, in the coming days, weeks and months! 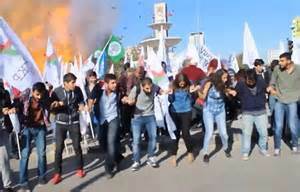 A dark and dangerous manifestation of this volatile and revolutionary celestial pattern between the Sun and Uranus, was the twin explosions that rocked a Peace Rally in Ankara, Turkey on Saturday. Ironically, the Sun and Moon in Libra represent peace; Uranus retrograde in Aries represents chaos. Uranian energy often ‘blows up’ the status quo, ripping the rug out from underneath us when necessary evolutionary changes have been resisted for far too long. Evolutionary forces of change can be constructive or destructive. Unfortunately, when the cry for necessary changes are consistently ignored over time, those who are ignored feel disenfranchised and then often feel it necessary to resort to violence to achieve their goals. It’s heartbreaking and sad that a Peace rally was so shockingly disrupted by EXTREMISTS (remember Libra rules extremes) who misused power in the most horrific way causing the deaths of nearly a hundred people and injuring hundreds more. But let’s be realistic. Extreme inequality relative to the balance of wealth and power is indeed a daily reality for billions of people the world over. The energy of this New Moon will increasingly and dramatically bring these imbalances to the fore and into our collective consciousness. The energy of this New Moon is revolutionary and will indeed manifest as change. The $64k question is, “What kind of change – constructive or destructive?” Of course the answer depends entirely upon what choices we make personally and globally. Venus rules Libra and this New Moon. Currently moving through Virgo, it reflects the need for HEALING. In order to heal extremism, we must make necessary adjustments in how we relate to one another. A greater sense of equality and balance must be restored. Dare I say we must learn to SHARE (Libra) resources and power? Clearly, we must change how we take care of ourselves, each other and our planet. To do so we must also embrace a much more honest, equal and realistic view of ourselves and others. Virgo always serves to realign us with REALITY – often through crises. Perhaps the growing crises of climate change and refugee migrations will encourage greater sharing and equality among humanity as our need to help one another in order to survive increases. 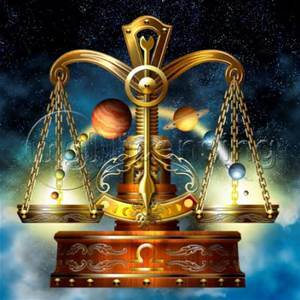 From an evolutionary perspective, Libra initiates a diversity of relationships with a diversity of others for the purpose of discovering who we are as individuals. Through the natural process of comparing and contrasting ourselves with others, we can come to know and appreciate what’s unique and different about ourselves. However, thousands of years of patriarchal conditioning, that views everything through the distorted lens of dominance, hierarchy and exclusion, has instead taught us to compare and contrast ourselves with others to determine hierarchical rank: who’s better and who’s worse, who’s richer and who’s poorer, who’s smarter, prettier, more successful, more powerful. If you view the world in this way, its inevitable that you will come to false conclusions about worth — both of yourself and of others. Another major contributing factor to inequality in relationships comes from the conditioning of man-made belief systems or what we call religions. Of the seven billion people who inhabit our planet, the majority of them believe in one of the world’s three largest religions: Judaism, Islam or Christianity. Unfortunately, ALL of these three major world religions teach fundamental inequalities. They believe in gender inequality teaching that men are superior to women. They also believe that humans are superior to animals and the environment teaching that mankind has ‘dominion over’ the natural world. Interestingly, the etymology of both ‘dominion’ and ‘dominate’ are the same. They also teach inequality of race believing that some races are superior to others which resulted in the infamous Papal Bull that established the doctrine of ‘Manifest Destiny’ that justified the land grabs and genocide of indigenous peoples throughout the Americas. Through thousands of years of conditioning influence, these patriarchal man-made religions have institutionalized false beliefs relative to INEQUALITY! Venus square Saturn in the New Moon chart can help us to throw off these distortions of the truth. If we choose, we can evolve beyond the social and cultural expectations to conform to these distorted values and beliefs. As Saturn moves through Sagittarius over the next two years, we’ll ALL be paying much greater attention to what we believe and why we believe it. Keep in mind that our beliefs form the very basis of how we interpret reality, so if our beliefs are faulty, it stands to reason that the conclusions we reach will likely also be false. If you are willing to do the necessary inner work of healing, especially regarding the elimination of victim consciousness, this month’s New Moon celestial energies can bring breakthroughs. If you will take full responsibility for your own choices and actions, and the realities you’ve co-created for yourself, you’ll benefit from heavenly support that brings greater emotional maturity and security. If you surrender your personal will to your higher Divine Will, then when Venus trines retrograde Pluto in Capricorn on the 22nd/23rd, you can reap many rewards particularly in the areas of personal and financial health and well-being, meaningful and right work, happier relationships with others and of course, a mind and heart at greater peace with itself and the world. Unequal and unbalanced relationship dynamics can heal now. You know that famous bumper sticker that says, “No Justice; No Peace”? Justice and peace require a fundamental sense of fairness and equality. It’s time to let go of distorted values and false belief systems that have conditioned us for centuries to blindly accept inequalities. Be especially mindful of your beliefs in the coming weeks and how those beliefs dictate the way in which you interpret reality, including how you see yourself and others. Truth is, WE ARE ALL ALL ONE, EQUAL IN THE EYES OF OUR CREATOR. The Scorpio New Moon is on November 11th at 10:47 am MST! This entry was posted in Planetary Events and tagged balance, equality, extremes, healing, health, Libra, power, relationships, Saturn, truth, Uranus, Venus, well-being. Bookmark the permalink. I learn so much astrology reading your reports .. thank you! Seems very timely this one! Thankyou for sharing astrology from an empowering perspective.